Michel Foucault offers the space and concept of a cemetery as an example of a heterotopia; he explains that it is such because over time the function of the cemetery has changed to reflect the prevailing culture. (2001: 241) At one time being the centre of the city, reflecting a more religious community spirit, in the Victorian times which brought with them not only a more atheistic attitude but also a greater awareness of disease, they were moved to the suburbs. (ibid.) 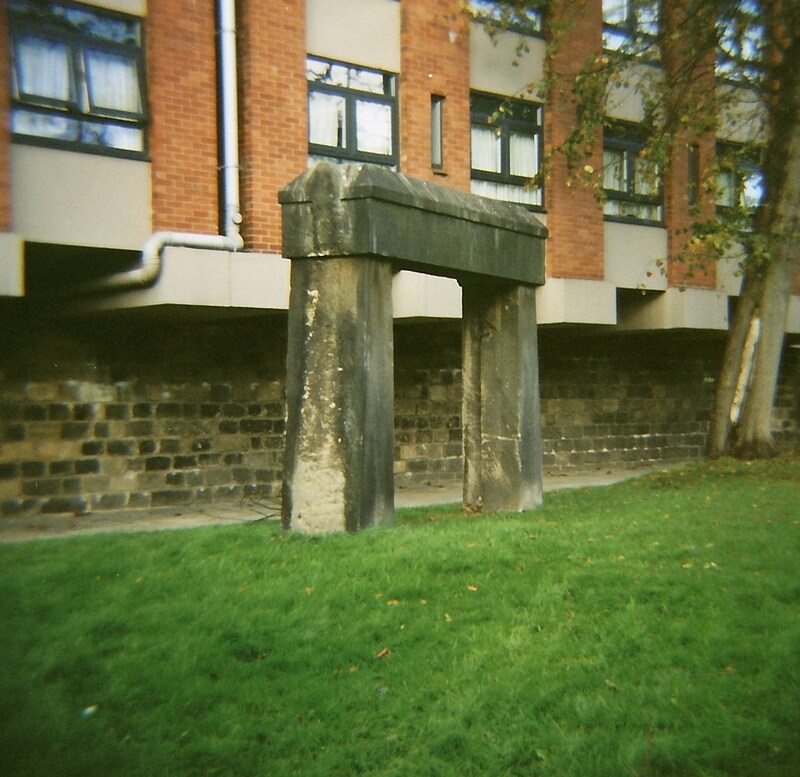 St George's Field (the cemetery at the University of Leeds) as it is discussed on this blogspot, confirms Foucault's second principle of the heterotopia, a historical place that has a determined position within culture, which can then be superseded by another function at a later time (ibid. ): in this case, the change of use from graveyard to garden. 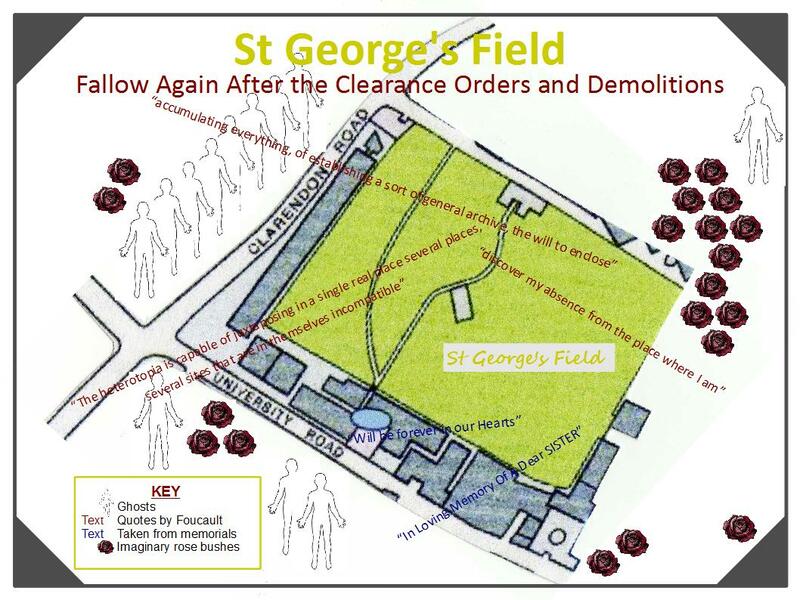 What is interesting about St George's Field, is that it not only holds true of the basic principles of what classifies a heterotopic space, it also has further qualities that a 'regular' cemetery might not. These further qualities have come about because of its condition of reuse set out in the 1960s. For example, as Foucault states in his third principle: "The heterotopia is capable of juxtaposing in a single real place several places, several sites that are in themselves incompatible." (ibid.) Is it possible for the cemetery to also be a garden? Can it comfortably be a sanctified place of rest for the dead and also a park-like area, open to all and contained within the boundaries and administrative structure of a university campus? I pose these questions, not because I intend to answer them, but so as to highlight the tensions inherent in the place. These very tensions being what creates a heterotopia in the first place. Foucault describes these simultaneous places as being "foreign to one another" (ibid.) and while the example of the cemetery as a heterotopia is apparent enough, he also provides the garden as an example of a heterotopia, because in antiquity gardens were originally created to represent a small version of the world. (2001: 238) To complicate the space of St George's Field further, the chapel is also a storage place for the university library and even has a library code assigned to it as a storage facility: STCHA. Foucault also classifies libraries as heterotopias, because they represent the modernist concept of "accumulating everything, of establishing a sort of general archive, the will to enclose [...] the idea of constituting a place of all times that is itself outside of time and inaccessible to its ravages". (2001: 242) Maybe this is even more so for St George's Field: since the chapel is already a preserved building, it is even more stable as a place than our high street public libraries, that have been under threat in the past few years. Foucault uses the mirror to explain the relationship with utopias (sites without places) and heterotopias. He describes the mirror as a type of utopia, by his own definition "a placeless place". (2001: 239) The mirror projects us into a place where we are not. However, the mirror is also a heterotopia in the sense that it does exist as a real object in space, enabling us to "discover [our] absence from the place where [we are]", since we can see we are located elsewhere. (ibid.) This has the effect whereby the gaze as it is located in the ground of the reflection, can be traced back towards us as the viewer, via the glass, and back into ourselves through our eyes, where we become restructured. (ibid.) As Foucault states, this has the effect of making the location of the subject conjured in the act of looking at the glass both "absolutely real" and "absolutely unreal". (ibid.) For a heterotopia such as a cemetery, this mirroring effect might also be evoked by the surface of the ground and the gravestones locating 'loved ones'. Please note: The images shown here, despite looking old, were taken in 2010 with a lomography camera, a Diana F+. Dying to Find It: Where is the University Cemetery? Barnard, Sylvia M. 2009. To Prove I'm Not Forgot: Living and Dying in a Victorian City (Stroud: The History Press). Graffiti: The Artform of the Proletariat? This is one of the more subtle ones. Illegal. Feared. Rejected by societal norms and described like cancers to communities, a destructive virus that consumes and devours decent proper values until suddenly there’s a crack house next door OR perhaps just another victim of Marx’s social alienation. Let’s be straight, America really has no problem with graffiti—as long as they can make a buck off it. The style has been mimicked and milked in almost every market, from designer t-shirts to XBOX games and countless hip-hop album covers. Yet despite all this corporate love, the act of getting up, putting the paint on the walls is still punishable by jail time and large amounts of debt. Graffiti is the art form of the proletariat. The bourgeoisie can’t sell off the walls of their factories so whatever the workers write on them is finally there’s to keep. It’s an art that cannot be exploited by those who own the means of production, because graffiti exploits them first. The proletariat artist is using the property of the bourgeoisie as a canvas—essentially redistributing the use of property to the people. In that sense graffiti writing becomes the last truly free artistic vehicle; it cannot be taxed and doesn’t have to be taught. Anyone can participate, regardless of class, race, religious preference or sexual orientation. Graffiti doesn’t even require consumption of any materials if the artist doesn’t wish to purchase them. According to old school ethics, paint should be stolen from supply stores as an act of liberation from bourgeoisie’s financial death-traps—but really, all you need is a rock and a hard surface to scratch on to make your mark. Until the 1960s St George's Field was a cemetery. Previously known as Woodhouse Cemetery and also Leeds General Cemetery, prior to it first becoming a cemetery in 1833 it was known as 'St Georges Field'. In 1969, when its function as a working cemetery was officially terminated, it reverted back to the name 'St Georges Field'. All the university maps refer to this space as St George's Field and there is very little historical information about it on the university website. If one types the word 'cemetery' into the university search engine, the first four items do include reference to the cemetery but take you to the university library archive, listing data on St George's Field. 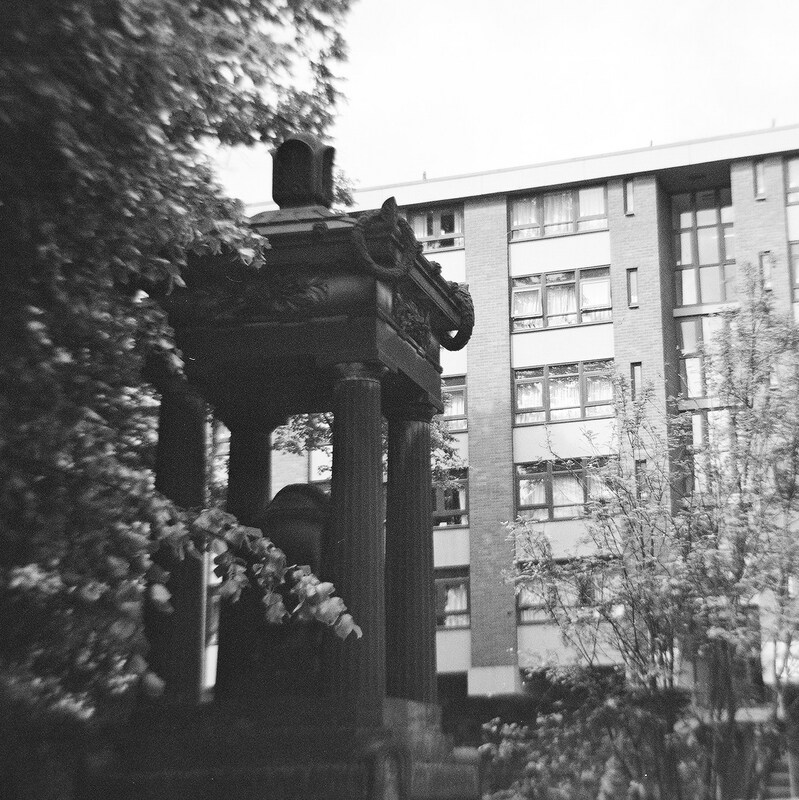 Most of the other links refer to "Cemetery Road" (the road that runs adjacent to St George's Field) and "Cemetery Lodge" (a part of the gatehouse of the original cemetery that still remains and exists as office and studio space for the School of Fine Art, History of Art and Cultural Studies). However, if one types 'St George's Field' into the university search engine a number of links appear from various departments at the university, for instance the Estates Office, and Access and Community Engagement. Also included are links that take you to information on some events that have been held there in the past few years, and to information on Pablo Fanque (the first black circus owner in Britain, who died in 1871 and is buried there along with his wife). 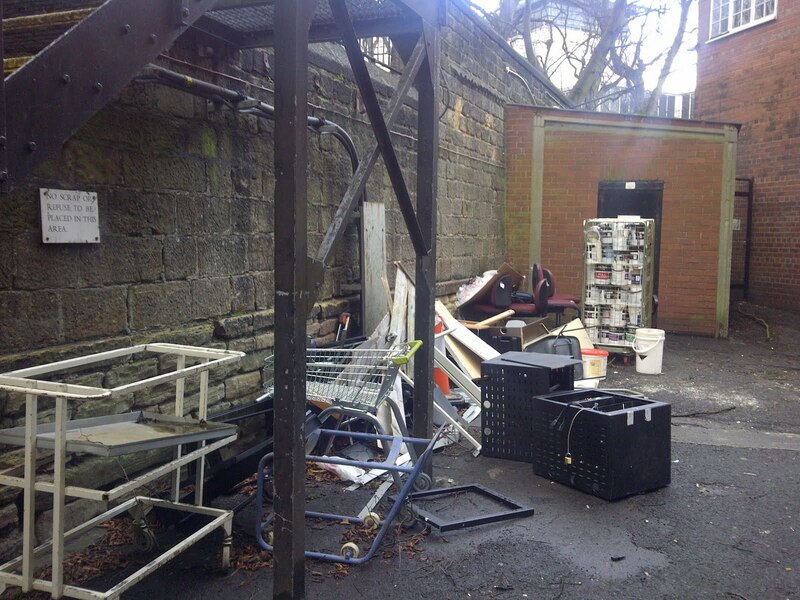 St George's Field is surrounded on all sides by walls and/or metal railings. At some places the wall is quite high on the outside, but because parts of the cemetery terrain are higher than the surrounding land, the walls can appear lower from the inside in some places. On the most northern side the area is bordered by the Henry Price Halls of Residence which sits, in a cantilever-effect, on the original wall of the cemetery and overlooks this field. The halls themselves are on the uppermost edge of the campus, facing Clarendon Road and, across from there, Woodhouse Moor (locally known as Hyde Park, although Hyde Park is actually the nearby neighbourhood in Leeds). The east-most side of the field is bordered primarily by engineering department buildings, but also a road, which includes a pedestrian path for only part of its length. While this is where the cemetery gatehouse is located, and there is a blue plaque outside stating that it was a cemetery, there are no signposts to the field in this area or anywhere on campus, only small signs like those located at all the entrances to the garden. The west edge of the field is bordered by a number of departments including Geography and also the School of Design. 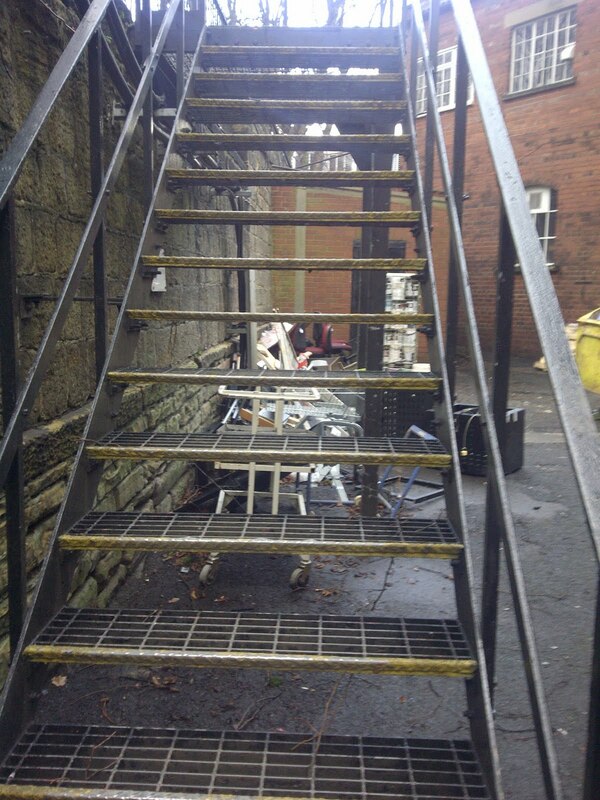 Behind these buildings can be found a small entrance into the field which is serviced by some steps. The southern edge of the cemetery is well hidden by a number of buildings including part of Chemistry. However, if one is curious enough to look, another entrance can be found to the field here via a metal staircase behind these buildings. Once in St George's Field the area is presented to you as a well-kept, landscaped park-like space. In the centre is the original chapel, now, apparently, storage space for the library. 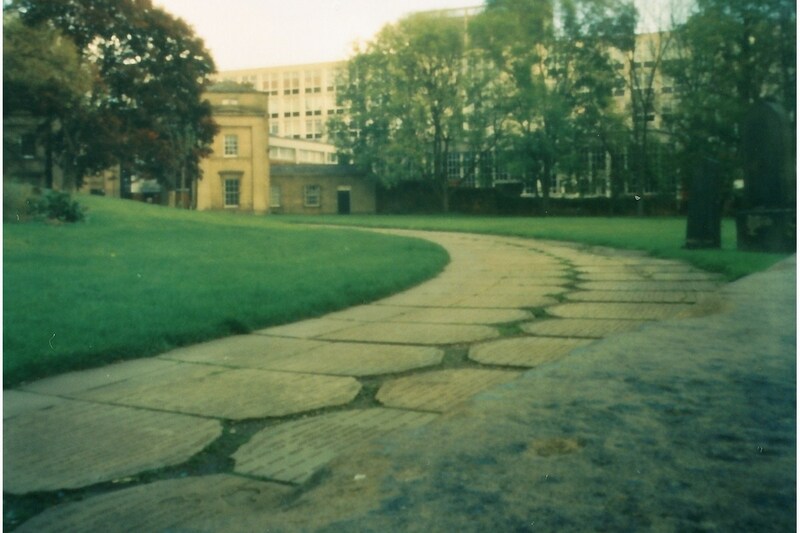 A main path leads to the chapel, from the gatehouse and from the back of the School of Geography. Much of this path is made from paupers' gravestones which list a number of people located in one burial plot (these paupers' gravestones are just about viewable in the first image in the blog). The chapel is in the middle of the space. The rest of the field is mostly a grass surface, with copse-like areas of trees and shrubs which have gravestones (but not paupers gravestones) located in them. There are also a number of old, large trees which are indexed with a metal number tag. The area is not completely flat even though some photographs suggest that it is. From an aesthetic perspective, the space is extremely pleasing to look at and quite peaceful despite not being far from the main road leading north-west out of Leeds. It looks more like a well-maintained municipal park than a cemetery. Since I already knew of the cemetery before I first saw it, I cannot say how it would feel to come across it by accident. However, I should imagine it would be a delightful surprise and maybe even produce a slightly uncanny reaction, because, in a sense, it is out of place and out of time, yet it is familiar due to its similarity to other parks one might have come across elsewhere in Britain. What is interesting, in this regard, is that despite it appearing to be temporally and spatially out of context, it was there long before the university, so one could argue that it is really the university which is 'out of place'. St George's Field could even be considered to be a little haven within the sea of learning and teaching and, in fact, on their website the Equality Service Department at the University of Leeds recommend it as a place for "quiet contemplation". As well as the gravestones which are located in pockets, there are a few large monument-type memorials (the above image is of a memorial to Leeds firemen). 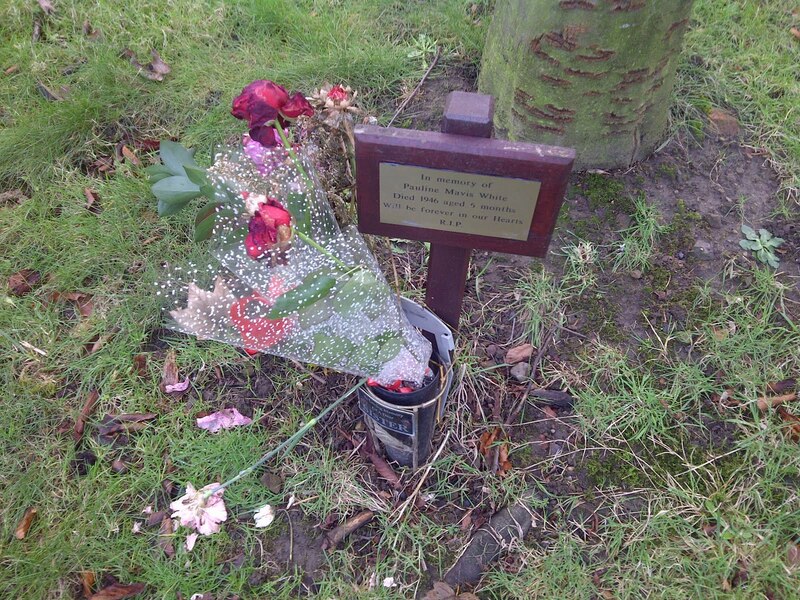 Upon closer examination there are a number of small memorials dotted about the area which appear in the form of small wooden plaques close to the ground, where gravestones appear to be either absent or never existed in the first place. There is also another path which eventually joins the main path. Part of this path is slightly hidden by shrubbery, but actually leads through more gravestones. The far end of this path leads through the wall on the north edge, to another entrance/exit. 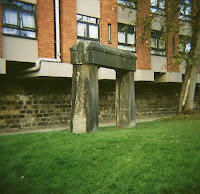 There is also a large, stone, free-standing, arch located near the Henry Price building (see below) and a similar one nearby, which is situated in the original wall and has now been filled in. The area is open to both university staff, students and the public, nevertheless most of the time it is very much empty of people, even in good weather. 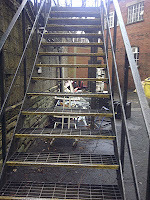 However, it is a short-cut, so it is used by those who know about it to head south across campus. Also, at times you can see people walking around looking at the gravestones, and on occasions one can come across other 'events' occurring there. 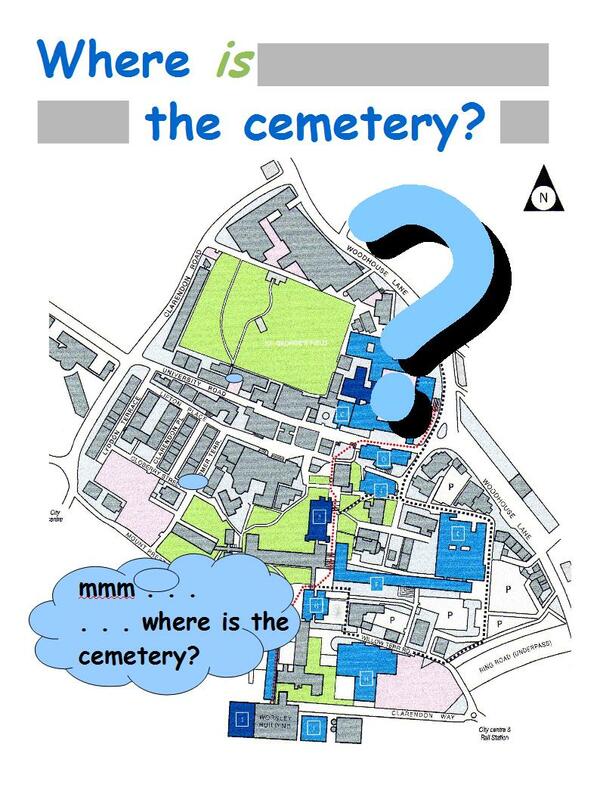 So, my question is: why is the cemetery 'hidden'? Schofield died in the Dark Arches Fire of 1892. The Dark Arches are located near the rail station in Leeds. Apparently there were 100,000 mourners at his funeral. One of the tasks I'd set myself was to photo all the entrance/exists to the cemetery, however I won't be including all of them in this blog, but rather some of the other phenomenon I came across: those things I wasn't expecting to encounter, like this rack of old paint, waiting to be chucked out along with much other rubbish. 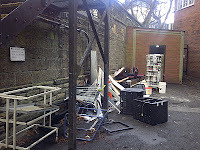 This entrance to the cemetery is located near the Maintenance building and behind the Old Mining Building. You would only find this entrance from the outside direction if you were snooping (as is my wont), because it is really well hidden. At one point I spotted lots of magpies under this tree. When I got there I found they had been eating the apples that were strewn over the floor beneath. Most of the apples were rotten, but many looked fine and must have survived in the cold weather. I've never come across the memorial before. I can't seem to find any information on the university website or even on google. I guess, because of his age, he had been a student at the university. I have visited this memorial a good few times over the past couple of years. Today I managed to get a good photo, which included some recently left red roses. So someone, probably her sister, still tends the memorial. My trip to the cemetery was psychogeographically interesting as it almost always is. I've included this final photo because despite earlier saying it wasn't sunny, I note some beams of sunlight filtering through the top of my image. *If anyone has a good crisp image of the helmet and would be happy to share it with me, that would be great. Thanks. Lady Macbeth by Johann Heinrich Füssli. The Leeds psychogeographer, Tina Richardson, has invented a new unit of time for psychogeographers, while sleeping! This unit of time lasts anything between 10 mins and 1 hour, but is significant because the quantity of time is uncertain to the psychogeographer due to the psycho-aesthetic state they are currently experiencing (what the psychogeographer Iain Sinclair would describe as 'reverie'). This unit of time is called a 'purse' and is rather like a pocket of time. The term refers to both the personal carrying device that contains items for the owner (these items are clearly subjective and reflect the individual owner of the purse), but also to the work of the semiotician Charles Sanders Peirce (pronounced 'purse'). Peirce's system contains 1) a sign 2) an object, and 3) an interpretant. The purse refers to the interpretant such that it is a subjective response to an object/sign that causes a specific state of consciousness for that particular person. For the psychogeographer these objects appear in the form of urban décor that have specific signs attached to them and are responded to by that individual (signs that could be compared to the Barthesian 'myth' e.g. connotative signs or second level semiology). 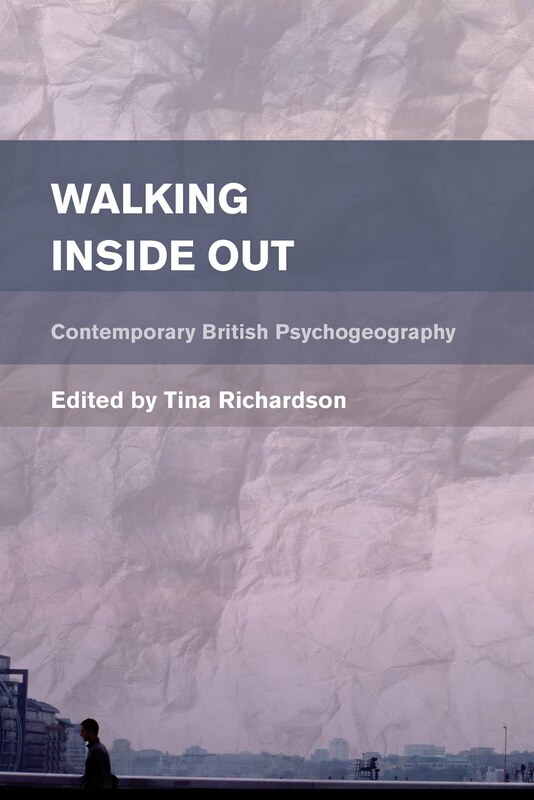 Ms. Richardson, who runs Leeds Psychogeography Group and guest lectures in schizocartography, said: "I hope that the 'purse' becomes a useful term for psychogeographers because it enables a form of recognition, and hence indexing, to take place that will encourage discussion on these very states that are what psychogeographers both experience and value in their own work." She added: "Also, I am designing an actual psychogeographers purse for wealthy wannabee psychogeographers who like the idea of urban walking but can't be bothered to do the actual walking itself. These designer purses will appear in the form of miniature distressed-looking rucksacks and will include a tiny chest-strap that will enable you to attach it to the designer dog of your choice."